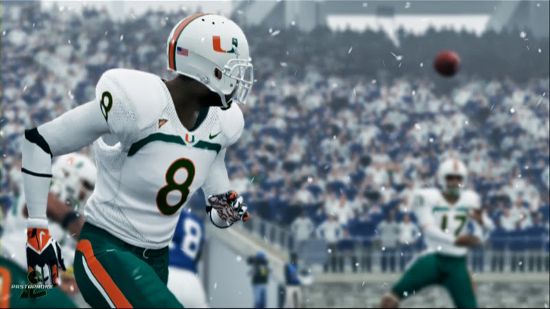 EA has won a previous case regarding player likeness with the courts ruling video games are artistic works rather than commercial speech and therefore protected by the First Amendment. The Supreme Court in 2011 established forms of media, producing expressive works of art, are not subject to judgments based on incorporating someone’s name or likeness. 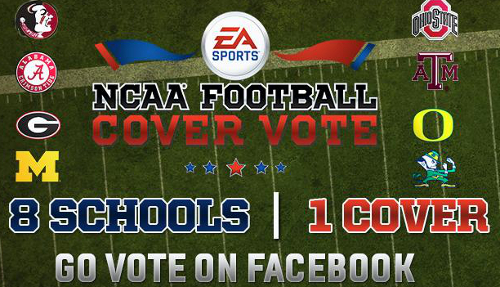 EA Sports today announced the schools that have advanced to the Elite Eight of the NCAA Football 14 cover tournament and have opened up the voting. Once again it is being handled through Facebook with a main poll which will be followed by secondary ones. Alabama led the way in the round of 16 followed closely behind by Texas A&M and Michigan. Those three had the benefit of being listed first in the poll options on Facebook which provided a huge advantage as users had to click through to another page to see the other programs. The trio totaled 88K votes which was more than the remaining 13 schools combined with 78K. That represents yet another gaffe in what has been a poorly staged cover vote process from the start. 6 of the 8 options from the primary poll are displayed on the main FB page with Oregon and Texas A&M now seemingly at a disadvantage. Penn State slipped out after looking as though they would likely advance. That leaves Notre Dame as the only program that EA would certainly like to avoid now given the Manti Te’o story. If they had planned for him to be a cover option that at least will have been scrapped now. Within the next 10 days the company will be announcing the potential cover athletes for the programs leading into a voting stage to choose the eventual candidate for each that will end on February 18. Though there is ample time to go in the voting round of eight programs for the NCAA Football 14 cover here is an update on the current standings. Michigan is leading the way with 22,044 votes and Alabama is close behind having totaled 20,343. Texas A&M is sitting comfortably at 12,623 while Oregon remains somewhat vulnerable with 8,111 votes. As things stand right now they would all be moving on to the final four. Florida State at 7,149 is in range to make a run at the final spot while Ohio State, Notre Dame, and Georgia look as though they won’t be going any further. If additional polls are posted though – depending on how they’re structured in particular – that could change their outlook. Unfortunately EA has not actually defined when this round of voting will actually end. Potential cover athletes for each school are expected to be announced by February 3 with the advancing schools and their athlete moving on come February 18. Just taking a guess here since it has not at all been made clear but the voting on athletes may represent the secondary poll/s for this round. That could shift the results dramatically depending on which programs have the most appealing individuals attached (more likely for non-fans to vote for players now than schools) and eliminate the fatigue of voting for the same school over and over by now as some have surely tuned out of the process. Could the silhouettes in the above image (larger version) provide hints at the soon-to-be-revealed candidates? That Michigan has a QB could be a sign of that given Denard Robinson would likely be their representative. The others are more difficult to define however. Alabama could be a running back which would make sense with Eddie Lacy, Georgia could be Jarvis Jones (in fact it may be based on this picture or one similar), Notre Dame might be Tyler Eifert (note the hair out the back of the helmet). What do you think for the others? Can Kansas slow down the Juggernaut? Kansas and their magical run to the National Championship culminates tonight in New Orleans against John Calipari and his KY Wildcats. KU should be outmatched at nearly every position…Kentucky’s length, outside shooting, depth, and Final Four experience (Lamb, Jones, and Miller) should be too much for Kansas to handle. 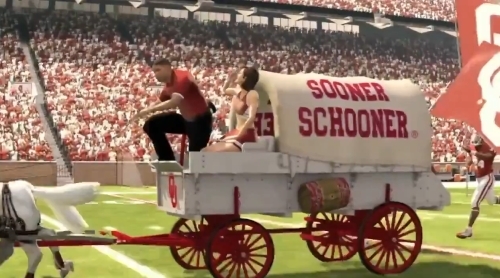 Unfortunately, the aforementioned don’t represent all the intangibles needed to win the National Championship. What KU does have going for it…chemistry, Bill Self, luck, and destiny…could marginalize Kentucky’s physical advantages. I think that the ride ends here and Kentucky will be too strong offensively and defensively for KU to stay with. However, even in a loss, KU could be awarded the title in a few months when the stench around Coach Cal’s Program leads to an NCAA Investigation. Either way…KU has no pressure on them tonight…nobody thinks they belong…or can beat the vaunted Wildcats. House Money. Rock Chalk! William “Bill” Russell, former star center for the National Basketball Association’s Boston Celtics, accused the National Collegiate Athletic Association of using his likeness from his college playing days without paying him or seeking his consent. The complaint is the latest to claim the NCAA violates federal antitrust laws by keeping former student basketball and football athletes from receiving compensation for the commercial use of their images and likenesses. The association has denied wrongdoing in those cases. Electronic Arts Inc., the second-largest U.S. video-game maker, is also named as a defendant in the lawsuit, filed yesterday in federal court in Oakland, California. Russell accuses it of using his image in a “Tournament of Legends” feature on an NCAA basketball video game. Russell, who led the University of San Francisco to NCAA championships in 1955 and 1956, said in the complaint that the association sells $150 videos of the team’s championship games. At least 54 clips featuring him are available through the website of the NCAA’s for-profit business partner and photos of him through an NCAA online store, according to the complaint. Russell, 77, is seeking a court order blocking further sale of the videos and video games, plus disgorgement of profits from them and unspecified damages. 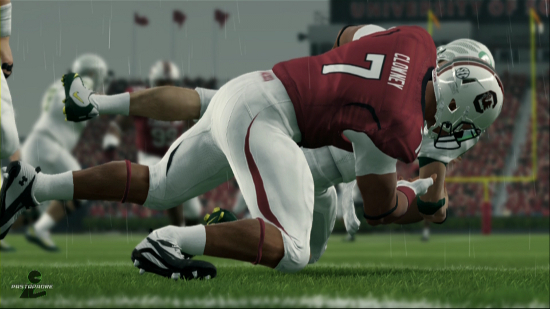 The NCAA owns and licenses the copyright on the NCAA games cited in the complaint, said Donald Remy, the association’s general counsel. The NCAA doesn’t restrict athletes from profiting from their college accomplishments through post- college commercial endorsements and other ventures, he said in an e-mail today. I’ve been obsessed with cornerbacks ever since I first saw Lester Hayes dip his hands in a bucket of Stickum. And growing up in the Bay Area, I’ve seen some greats run by me backwards, from a young Ronnie Lott to Mike Haynes to even a season of Deion Sanders. 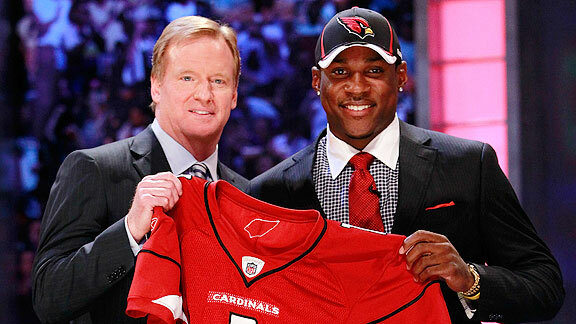 Next in line to go “primetime” is the Cardinals first-round pick, Patrick Peterson. With P-Squared, we’re talking ball hawking, blanket coverage, and the type of return skills that make you think back to the days of Deion dripping in jewelry. But I’m not the only one high on Peterson, as “Madden NFL 12” ratings guru Donny Moore has informed me that Arizona’s electrifying corner will be the highest-rated rookie in the game with an 82 overall, including 97 speed, 96 agility, 93 acceleration, 93 jumping, 77 catching (highest for any rookie CB), and 91 return. In terms of his defensive skill set, Peterson clocks in with 89 man coverage, 82 zone coverage, and 90 press. Not bad for a kid who grew up gaming, dreaming of the day when he’d finally see his face in the “Madden” franchise.